In order to catch the Batam ferry to Anambas, you need to head for Batam first. There's a flight from Jakarta to Bintan, so this is easy. From Singapore, there are quite a few ferry operators that go to Batam and tickets can be booked online. 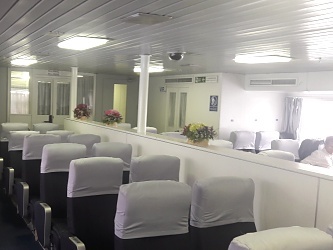 That said, keep in mind that the Batam ferry to Anambas departs quite early in the morning, so make sure you take one of the Singapore to Batam ferries that arrives in time for you to make your way to the ferry port in Batam, i.e. before the Anambas ferry has departed. It's feasible, albeit a tad on the tight side. Incidentally, boarding for the Batam to Anambas ferry closes half an hour before departure time, so if you're running a little late, get help from your Anambas ferry ticket provider. They'll try to assist. 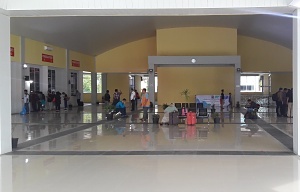 Once you've reached the ferry terminal, just present your ferry booking overview print-out to the Batam ferry counter staff. They will verify your online booking, after which you'll be handed your ferry tickets. You can then make your way to the waiting room. Boarding will be announced. 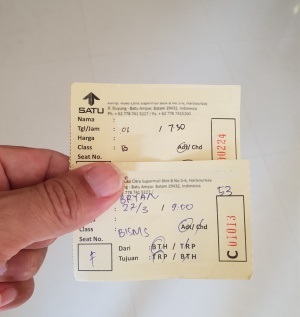 The cost of a one-way ferry ticket from Batam to Tarempa varies from US$ 55 to US$ 100 per person, per one-way ticket, subject to which class you prefer: Economy, Business or VIP. Batam - Letung ranges from US$ 50 to US$ 90, subject to selected class. By the way, the Letung to Tarempa hop is US$ 20 - US$ 50. Ditto vice versa. The Batam to Anambas ferry gets to Anambas quite a bit quicker than the Bintan to Anambas ferry; from Batam the journey to Anambas takes about 7 hours or so, including the Letung stop-over. By the way, the Batam to Anambas ferry is newer and more comfortable than the somewhat more old-school Bintan to Anambas ferry. This is something you may want to keep in mind if you prefer a fresher and less congested cabin. 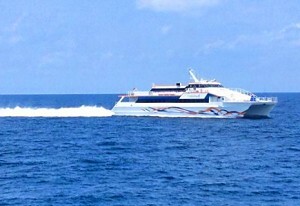 The Batam to Anambas ferry offers Pullman-quality seats and generally scores higher marks in the comfort department. Note that weather, tide, currents and sea state can all influence the ferry journey duration. When it's windy, which is usually the case during the November to March monsoon season, wind-swept swell may result in slower boat speed and, hence, a longer journey. In fact, occassionally, the weather is too rough during the monsoon, resulting in the ferry to Anambas being cancelled altogether. The rest of the year, April to October, crossings should be uneventful. However, departure time is always subject to change, so get the latest ferry schedule updates from your ferry ticket provider the day before your trip. They will gladly assist. NOTE: Booking the Batam ferry to Anambas in advance is recommended, as there is only one single crossing every other day. Incidentally, if you haven't got that much time for your trip and just want to get to Anambas as soon as you can, then taking the plane is recommended.